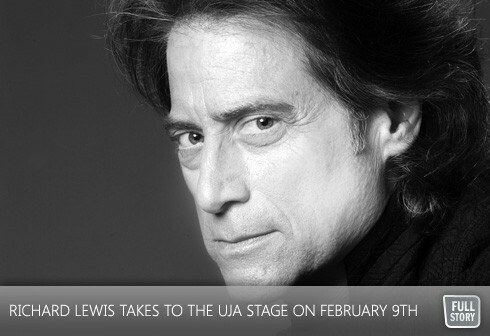 By Daniel Horowitz—Richard Lewis, the featured performer at United Jewish Appeal’s upcoming Campaign 2012 closing celebration on February 9th, has accumulated an impressive array of well-deserved kudos for his unique, neurotic and hysterical comedy over the years. Recognized by Comedy Central as one of the top 50 stand-up comedians of all time and included on GQ Magazine's list of the '20th Century's Most Influential Humorists’, the 64-year-old Lewis shows absolutely no sign of slowing down. And, while he admits that the accolades are “nice”, Lewis, one of the stars of HBO’s critically-acclaimed Curb Your Enthusiasm, is quick to credit those who came before him as being the true comedy greats. While Lewis has had a profound impact on comedy, he’s also impacted our vernacular as well. Lewis claims to be the originator of the phrase "The ______ from hell" as in "the date from hell" or "the roommate from hell". This theory is expounded upon in the Curb Your Enthusiasm episode "The Nanny from Hell". In fact, Lewis has petitioned the editors of Bartlett's to be given credit for the coinage, but the editors claim that the phrase was a common idiom prior to Lewis' use of it. However, the Yale Book of Quotations does attribute the phrase to Lewis, so we’ll give him that one. Born in 1947 in Brooklyn, New York, and raised in Englewood, New Jersey, Lewis graduated from Ohio State University in 1969 with a degree in marketing and communications. He wrote ad copy in New Jersey while also writing jokes for comedians. Lewis is no stranger to Toronto, and, clearly he looks forward to his February visit. Being cast on Curb Your Enthusiasm just may have been preordained for Lewis - he first met Larry David, the show’s creator and the man behind Seinfeld, when both were about 12 years old, around 1960. Lewis, a self-confessed political junkie who enjoys listening to jazz and classic rock when he’s not on stage, has dealt with – and continues to deal with - his share of struggles. As a recovering alcoholic for almost 18 years, Lewis has a special place in his heart for the holiest of Jewish holidays. “I’ve grown to really appreciate the importance – not only as a Jew – but as a person, for much of the significance of Yom Kippur for atonement and repentance,” he says without a trace of humour. So, tell me Richard, which is your least favourite Jewish holiday? So, rather than “risking” Richard Lewis come to your home for, say, a Passover seder where sugar is all-too-present, it may be easier to join him on Thursday, February 9th, at Toronto’s Events on the Park (1095 Leslie Street) at 7:30 p.m.
Purchase tickets online at ujaevents.com/registration/lewis or by email at jgonik@ujafed.org or call 416.635.2883 EXT. 5229.